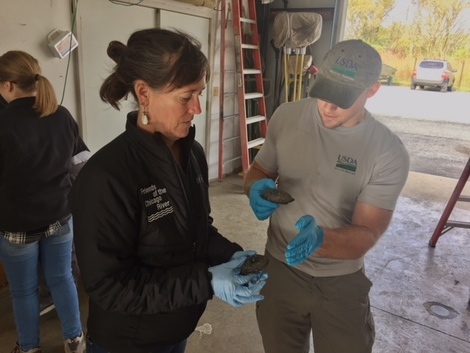 Friends of the Chicago River recently teamed up with scientists from the Forest Preserves of Cook County and the United States Department of Agriculture to attach transmitters to 20 turtles to measure the effectiveness of our habitat restoration efforts near the Cal Sag Channel. 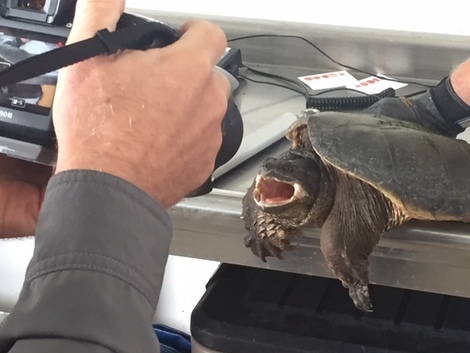 The transmitters will allow researchers to track the turtles to determine if the creatures use an area Friends cleared near Archer Avenue and the river, a safer and likely more successful nesting ground. 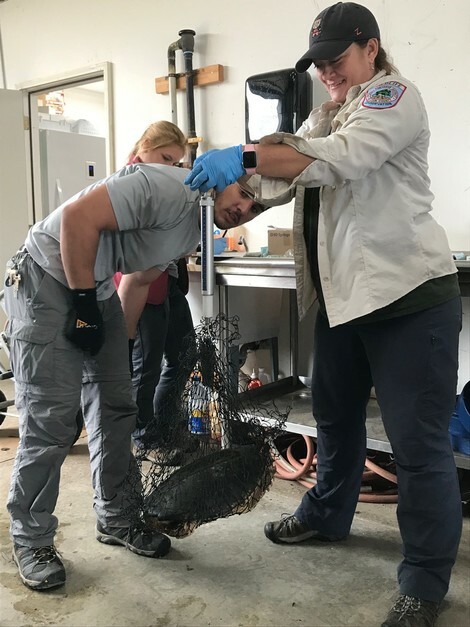 The process began with trapping the turtles in the wild and then bringing them to the Cook County Forest Preserve’s McGinnis Field Station near Orland Park. 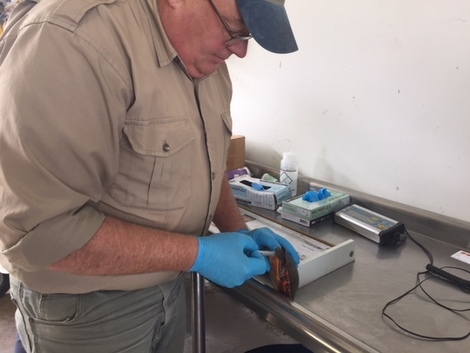 There, the team measured and weighed the turtles, adding tiny chips beneath their flesh to allow researchers to identify them in the future, similar to the chips used for household pets. 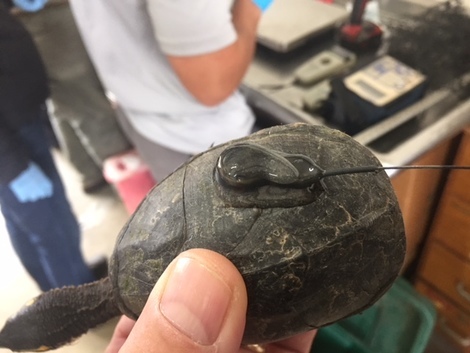 Blood and fluid samples were taken and the quarter-sized transmitters were glued to the turtles' shells to electronically follow them as they move through the natural area. A tracking device, affixed with Gorilla Glue, can stay active for two to three years. Invasive plant species such as buckthorn block sunlight making potential turtle habitat inhospitable. Instead, the turtles lay eggs in more dangerous locations such as roads and paths which have more sunlight but make the eggs and turtles vulnerable to cars, humans and predatory animals. Not only does clearing the acres of invasive species help turtle reproduction but such cleared land also absorbs more water, helping with flooding and relieving pressure on the sewage system. 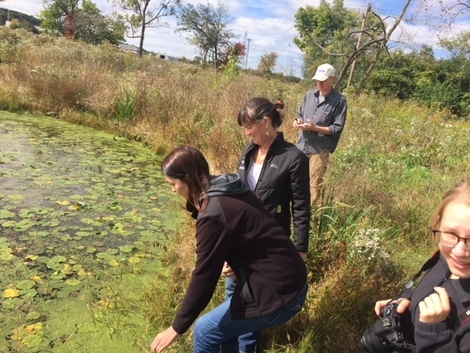 In an interview with the Chicago Tribune, Friends Executive Director Margaret Frisbie said the turtle efforts can help explain to the public the value of land restoration. 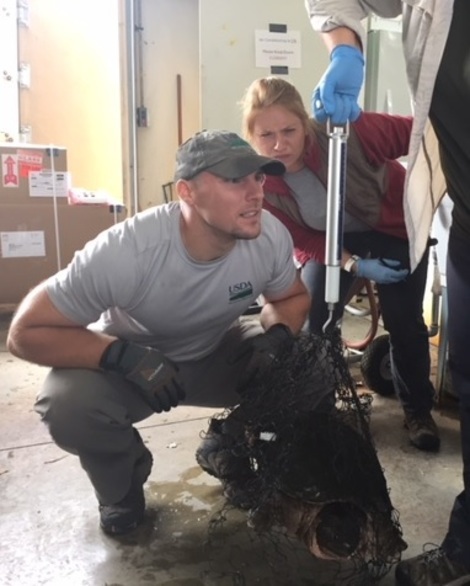 Turtles, she said, are “an ambassador species that people will invest in” and they provide an opening to talk to the public about more complex issues such as invasive species and flooding. A line of scientists weighed, measured, took samples from the turtles and then affixed the transmitters. Friends has been working with the Forest Preserves in turtle nesting habitat restoration projects since 2015, including efforts at Watersmeet Woods in Winnetka, Chipilly Woods in Northbrook, Skokie Lagoons in Glencoe, Wampum Lake Woods in Thornton and Sag Quarries in Lemont. Nearly 100 acres of river turtle restoration has occurred in those preserves and the aim is to add 51 acres of Chipilly Woods over the next two years. In Wampum and Chilpilly similar tracking studies revealed that turtles moved to the restored areas the first season they were cleared. Friends' Conservation Specialist Maggie Jones participated in the tagging process. 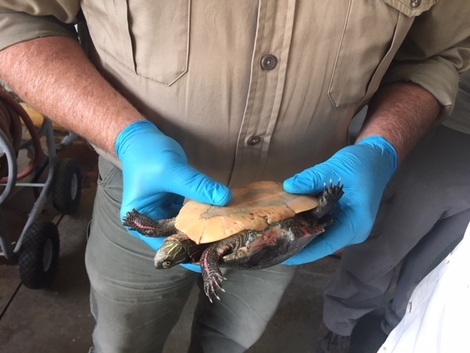 Snapping, painted and stinkpot turtles were used. Cook County Forest Preserves senior wildlife biologist Chris Anchor described Friends as an invaluable partner. 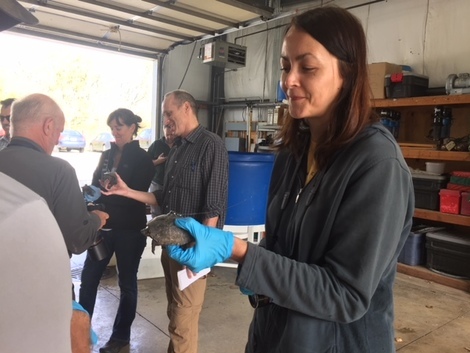 Friends Executive Director Margaret Frisbie, center, and Friends Conservation Specialist Maggie Jones release the transmitter-equipped turtles back into the river. This snapper tries to take a bite out of Chicago Tribune photographer Zbigniew Bzdak. 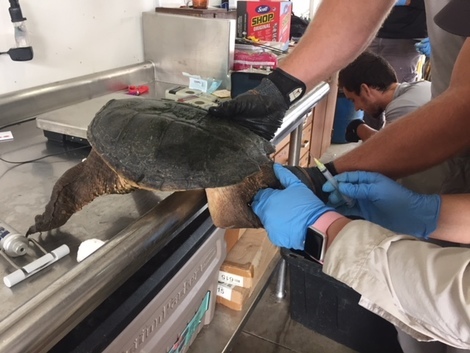 Blood and other fluids were sampled from the turtles to check their health and to use for comparison years from now. 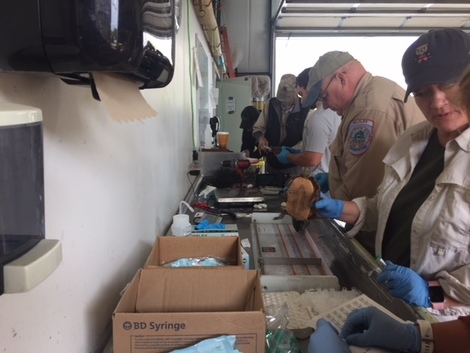 After the transmitters were affixed, the turtles had to be held steady for several minutes in order for the glue to dry. This turtle shows signs of being attacked by an otter. Forest Preserves of Cook County senior wildlife biologist Chris Anchor has been working to protect and promote wildlife for more than 30 years.